Tired of cleaning up fallen pine needles, but trying to stay away from buying a fake tree? 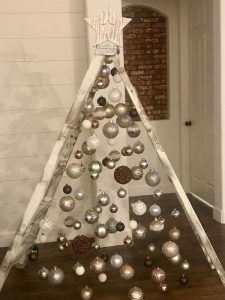 We gathered a few ideas on Christmas tree alternatives that will change up your decor this holiday season. 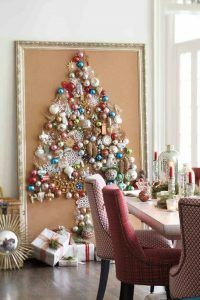 Cork Board Tree: All you need is a framed cork board sheet, thumbtacks and ornaments. 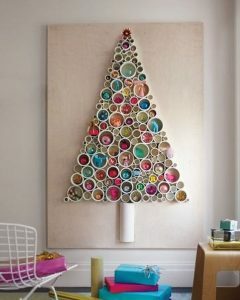 Then, arrange your ornaments into a tree-like shape and attach with thumbtacks. Ladder Tree: For all you DIY experts, this is the perfect tree for you! Grab a ladder and clear fishing lines. Use the ornaments to create the shape of a tree. 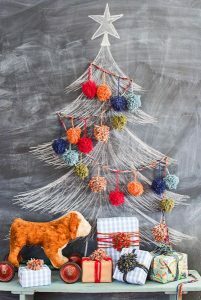 Peg Board Tree: It’s simple, pretty and straight to the point. 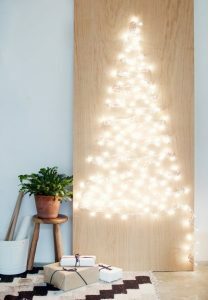 A piece of ply wood, screws and twinkling lights are all you need. Chalkboard Tree: This tree is great for classrooms or the kids’ room. If you don’t have a chalkboard, you can purchase chalkboard paint. Draw your Christmas tree with colorful chalk and using nails, hang ornaments and twinkling lights from the wall. Your ornaments will really pop! 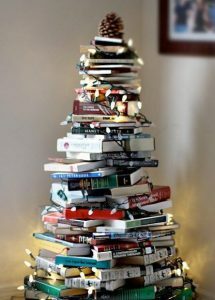 Book Tree: For all book lovers, this tree is the best and least expensive alternative Christmas tree. Pile all your favorite books in the shape of a tree and wrap twinkling lights around it. Great for small apartments!